University of Chicago Press, 9780226086651, 420pp. 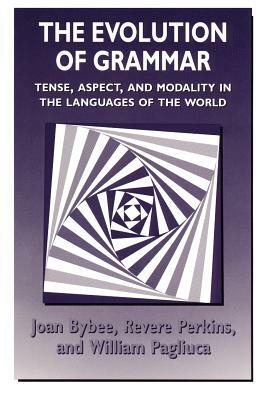 Joan Bybee and her colleagues present a new theory of the evolution of grammar that links structure and meaning in a way that directly challenges most contemporary versions of generative grammar. This study focuses on the use and meaning of grammatical markers of tense, aspect, and modality and identifies a universal set of grammatical categories. The authors demonstrate that the semantic content of these categories evolves gradually and that this process of evolution is strikingly similar across unrelated languages. Through a survey of seventy-six languages in twenty-five different phyla, the authors show that the same paths of change occur universally and that movement along these paths is in one direction only. This analysis reveals that lexical substance evolves into grammatical substance through various mechanisms of change, such as metaphorical extension and the conventionalization of implicature. Grammaticization is always accompanied by an increase in frequency of the grammatical marker, providing clear evidence that language use is a major factor in the evolution of synchronic language states. The Evolution of Grammar has important implications for the development of language and for the study of cognitive processes in general.